Join us from 1pm to 4pm on July 28th for our Gundam Building Party! We just relax and build Gundams or any other models you choose to bring! We'll supply some tools you can borrow at the event but your must bring your own model kit, we can not sell them at the event, sorry! Our massive annual Free Comic Book Day event! Sales, Guests, Vendors, Live Music, FREE Comics and much, much more! Hey, Hot Shot! Think you've got what it takes to beat Level Up's Retro Challenge? Stop by the Otto Bruyns Public Library of Northfield to build models with us! We'll have experts on hand to help with leanring new skills and some supplies you can borrow and try out! Save 20% OFF all Marvel merchandise from 12/24 to 12/30! Save 20% OFF on everything Funko from 12/17 to 12/23. Save 20% off all Star Wars items from 12/10 to 12/16! Save 20% OFF everything DC from 12/3 - 12/9! Save 25% OFF Funko merchandise, comics, graphic novels, and select video games during our Cyber Monday Sale! Level Up's huge Black Friday Sale is 11/24, 6 AM to 9 PM! 20% OFF (almost) Everything in-store! One day only! Level Up Entertainment is proud to announce our Selfie September Pinball Tournament! Starting on September 1st, all players of the Star Wars pinball machine at Level Up can post and record their highest scores for entry in our latest high-score contest! Players must record their scores by taking a selfie photo showing both the score and their face. Comedic poses are encouraged. You can submit your selfie score to Facebook, by tagging @LvlUpPinball on Instagram, or by email to LvlUpPinball@gmail.com. All submissions must include your full name and email address so we can contact you if you win! You can enter as many times as you want but only your highest score will count! The top 3 scores will win gift cards to Level Up Entertainment and the highest score will walk away with a custom trophy! Players may check the standings online at MatchPlay. Scorekeepers will update the scores and standings on a semi-regular basis, making sure they are current at the end of each week. If your score is not in the top 3, head back to Level Up and keep playing! Remember you only need to submit additional entries for scores that are better than your previous games recorded, as only your best score counts. 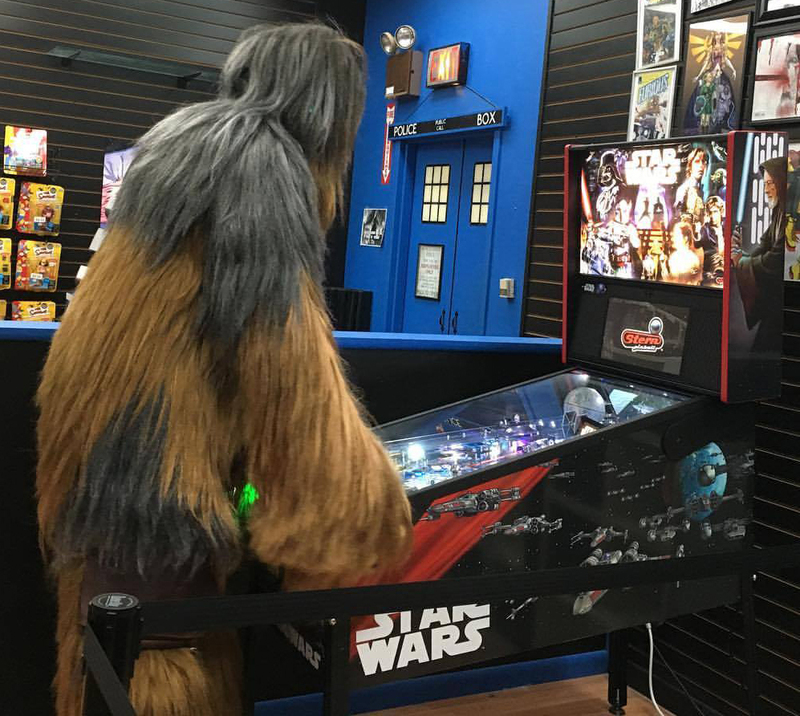 Anyone caught by other players or the tournament organizers having posted scores that were not their own, not from the Star Wars machine at Level Up Entertainment, or other forms of cheating, will be disqualified and that player will not be submitted in the results. Players are to submit scores when they are recorded or in a timely manner. As in you should not get 5 billion points and wait to post the score until the last day of qualifying! Scores submitted at the last possible moment found to have been earned much earlier will not be counted. Remember, the machine itself also keeps track of high scores and it will be checked regularly! During the month, Stern may release updates to the code of the game. To protect the tournament, Level Up will NOT update the code during the month of September unless necessary to patch a major exploit or catastrophic bug. In that event, the code update and any effects to scoring will be announced via social media. If Star Wars goes down and is unavailable for play for an extended period of time, the tournament will end and all current scores will be locked in as final. Thanks for reading and hope to see you all soon with some SUPER STAR WARS SELFIES and high scores! Save 25% off Funko items online and in store! Use discount code LUXMAS at checkout. Save 25% Off select Star Wars items online and in store from 12/11 - 12/17! Use Discount Code LUXMAS at checkout! Save 25% OFF select Nintendo merchandise! Select from Pokemon plush and toys, Nintendo toys, comics, Legend of Zelda toys and comics, and more! Shop in store or online. Sale ends 12/10. Use code LUXMAS at checkout. Check out our online Black Friday sales starting at 12 am on Thanksgiving! It's that time of the year again! Our Black Friday sales kick off online and in store on Thanksgiving. Level Up will be open from 7 pm to 12 am on Thanksgiving 11/24 and 6 am to 10 pm on Black Friday 11/25. Sales are good while supplies last. In store sales are only available in person and online sale are only available online.